From the crazy weather department... SXSW is gettin' insane... now there's a SXSW Pre Party with DJ Rapid Ric @ Salvage Vanguard Theater this Friday, March 7th. 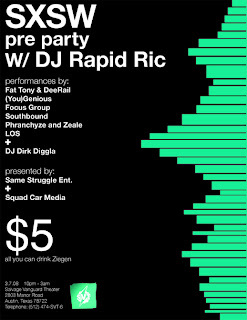 Performances by Fat Tony & Dee Rail, (You)Genious, Focus Group, Southbound, Phranchyze and Zeale, LOS, and DJ Dirk Diggla. While Texas’ slow and soulful underground movement went mainstream in 2005, millions of CD’s by Texas artists flew off the shelves as MTV and even the New York Times co-signed the Lone Star State. Meanwhile, every mixtape Rapid Ric dropped (Z-Ro’s Greatest Verses, Whut It Dew 2, Afta Da Relays, Getcha Weight Up, King of the Trill, Whut it Dew 3) boosted his star higher as Texas stayed hot on Atlanta's heels as the next big thing in Southern hip-hop music. In 2006, the 25-year-old set himself even farther apart from his peers with “Before Da Relays”, “Afta Da Relays”, Chalie Boy’s “Versatyle Child”, Magno’s “City Boyz” and the 4th quarter monster “Whut It Dew 4”. He mans the pipeline of the Lone Star State's top talent, furthering the self-made legacy of Screw, Swishahouse’s Michael Watts, Chamillitary and Slim Thug’s Boss Hogg Outlaws. Rapid Ric’s Whut it Dew series – the first of which was hosted by Chamillionaire prior to his platinum debut album – has solidified his niche as a trendsetter and tastemaker by progressing Texas’ regional underground sound.